Lakers spanish star Pau Gasol will guest star on the popular Univision telenovela "Eva Luna!". 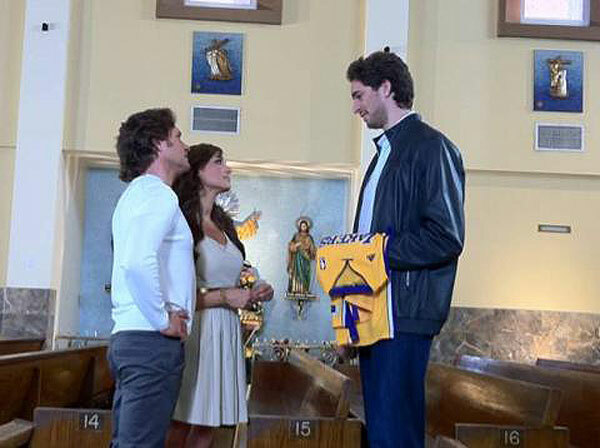 Left to right: Daniel (Guy Ecker), Eva (Blanca Soto) and Gasol meet up at the church for an unexpected twist and turn of events in the fascinating finale of Univision's hit primetime novela "Eva Luna." "I am delighted to participate in a novela that is so important and to have the opportunity to be part of the final episode and be one of the surprises for the audience," said Pau Gasol, NBA sports star and Lakers' player. "I am excited to be able to get closer to the Hispanic audience in this way." "The special appearance of NBA star, Pau Gasol, in 'Eva Luna's' grand finale is one of our many surprises," said Luis Fernandez, president of entertainment for Univision Network and Univision Studios. "Univision is the home for Hispanic America which is why we are honored to have a great champion join us for the finale of this winning novela."